Eight years ago we began to live with this thing called Congenital Heart Defects. It was never invited and never welcome in our home or any one else's for that matter. Just ask anyone who has a child or has lost a child with CHD. We have all had no choice really. It forces itself on families that never would have guessed anything was wrong. When our beautiful baby girl was born it altered her perfect heart in a big way physically, but it absolutely did not bring her down in any way. Although CHD is'nt a guest any family would wish to have, we have all learned volumes from our journey with it. I’ve learned about emotions that I have heard some talk about, but never really knew what they felt like. Emotions like grief, anxiety, fear, hope, faith, –just to name a few. Just like so many others, Congenital heart defects are our trial and although Olivia looks normal and healthy…she fights everyday. Her heart and soul is as mighty as they come no matter what comes her way, as do all kids with CHD. All of us continue to grow stronger everday that they fight this fight. She will overcome CHD along with millions of others who are fighting against these defects, some who begin fighting even before they ever even take their first breath. We will not stop the fight. Although it has taught our family so much about life and living and feeling, hope and trust. I wouldn’t trade those lessons for anything or any of the lifelong friends that we have met along the way. 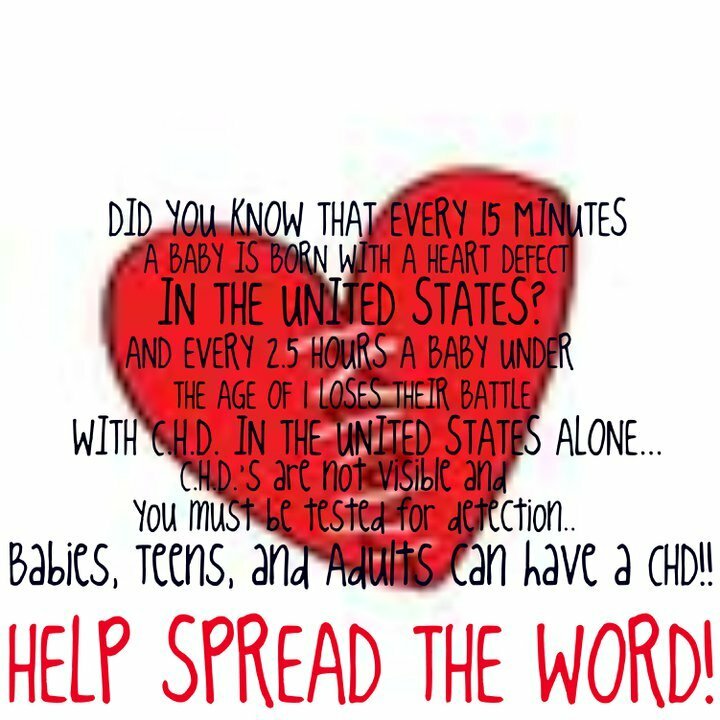 I continue to spread awareness because I don’t want CHD to hurt others or another mother to carry the grief of losing her child to CHD, like we have along with so many others. I fight for other parents and families who suffer through surgeries and hospital stays like we have and those that will one day have to. I don’t want another child to ever have to say through sobs, “I don’t want to do this!” So, for now, we accept that this is a part of our journey. We accept this trial that has been thrown our way…We will learn from it and grow in ways I would have never thought possible, just as we have for eight years now. We do this with strength from the Lord and Faith in Him. "I can do all things through Christ who gives me strength. : Phil 4:13. So even though February and CHD awareness month comes to a close. We will continue to fight and spread awareness all year long. We hope that you will join us.